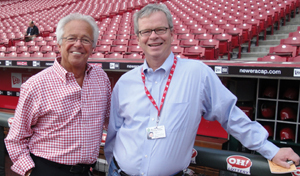 In episode five of Whack Reds Radio, we track down Cincinnati Reds beat writer John Fay. John gives us his thoughts on Edinson Volquez, explains his beef with Brandon Phillips, and shuts us down regarding Mike Leake's "Godzilla" comment. Check out Mr. Fay's blog or follow him on twitter.